To call them massive and awe-inspiring would be an understatement. 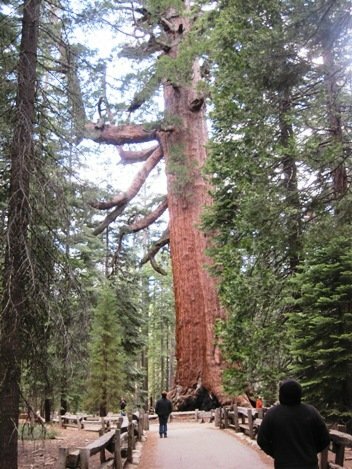 The Giant Sequoia, tree like the approximately 500 mature ones found in the Mariposa Grove near the South Entrance of Yosemite National Park, are perhaps the largest living things on Earth. 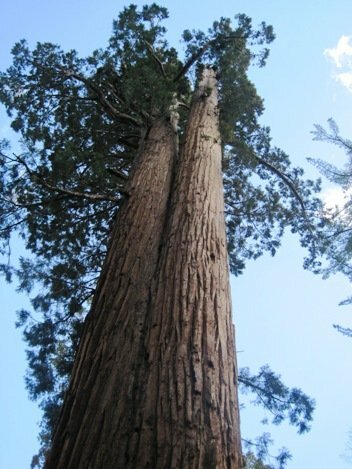 While the sequoias are not the tallest of all trees – that title belongs to the coast redwood found in places such as Muir Woods National Monument and Redwood National Park – they are the most massive in sheer volume. Mariposa Grove is located near Wawona, California in the southernmost part of Yosemite National Park, and is the largest grove of Giant Sequoias in the Park. 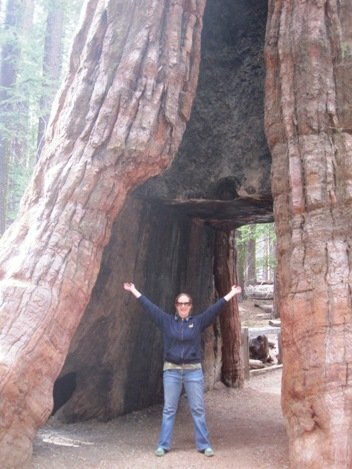 Two of the Giant Sequoias in the Mariposa Grove are among the 25 largest in the world. 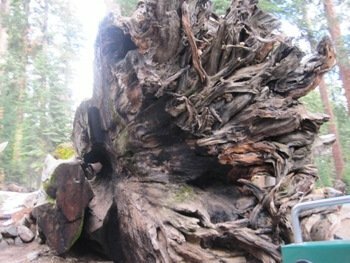 The Fallen Monarch: This tree fell more than three hundred years ago, but because Giant Sequoias are resistant to decay, their remains can linger for countless years if left undisturbed. The Bachelor and Three Graces: A group of four trees, three of them (the Graces) growing very close together, with a fourth (the Bachelor) a few steps away. It is said that the roots of the four trees are so intertwined that if one of them were to fall, the others would likely go with it. 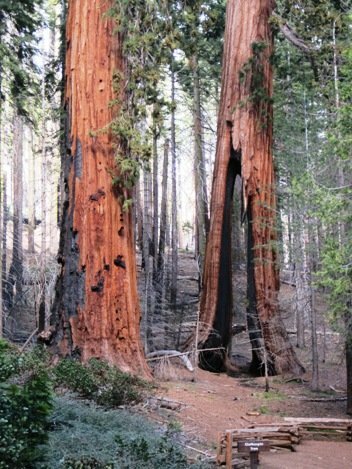 The Faithful Couple: These two trees have grown so close together that their trunks have actually fused together at the base. The Clothespin Tree: Numerous fires throughout the decades have nearly severed this tree’s trunk, creating a hole large enough for a pick-up truck to drive through. 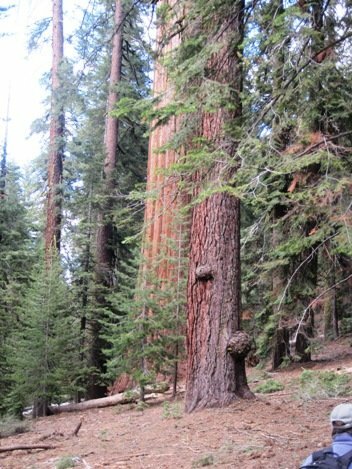 The Galen Clark Tree: It is said that this tree (it’s the redish one in the back) was the first Giant Sequoia seen by Galen Clark when he entered the grove; it inspired his love for the massive trees. 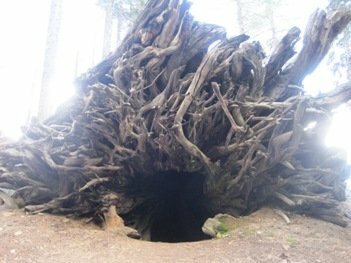 The Wawona Tunnel Tree: Before this tree came crashing down during a snow storm in 1969 and was renamed to “The Fallen Tunnel Tree” it was known as the first tree to have a tunnel carved through its trunk. 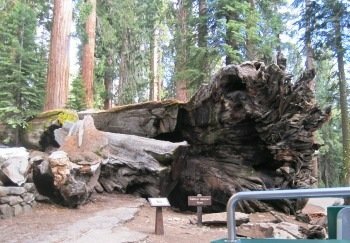 The Fallen Giant: One of the largest trees in the grove, until it fell in 1873. 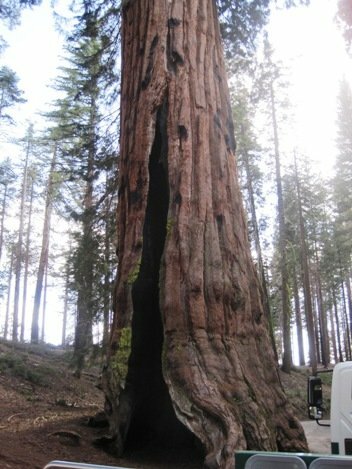 The Telescope Tree: Due to repeated fires, this tree has become completely hollow on the inside and yet it still survives; Giant Sequoias do not require a whole trunk to survive. It is possible to walk inside the tree and, from there, see the sky. 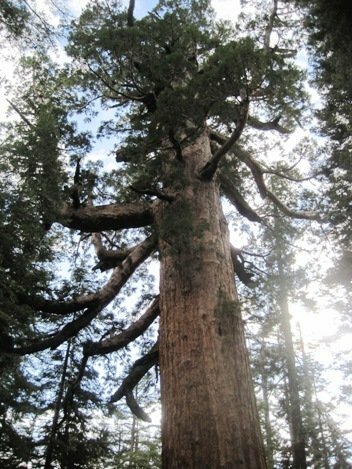 The Columbia Tree: The tallest tree in the grove and in Yosemite National Park, standing at 285 feet. 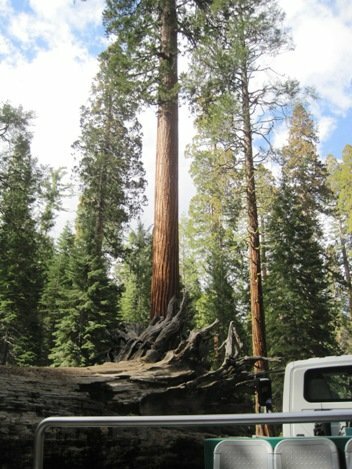 The Grizzly Giant: The oldest tree in the grove, the Grizzly Giant was claimed by parked officials as the fifth largest tree in the world in 1932, with a volume of 34,010 cubic feet; that record has since been beat and the massive tree is now said to be the 25th largest tree in the world. 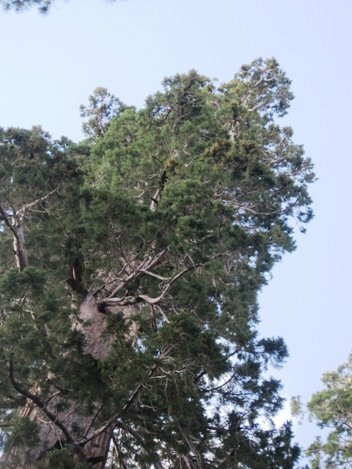 The first branch from the bottom is 6 feet in diameter. 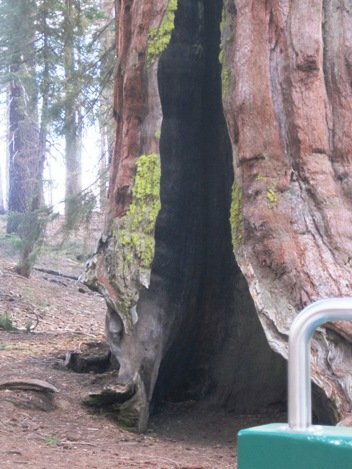 The California Tunnel Tree: In 1895 a hole was cut in this tree to to allow coaches to pass through it, as well as act as a marketing scheme to attract visitors to the grove; currently the only living tree with a tunnel in it since the fall of the Wawona Tunnel Tree. 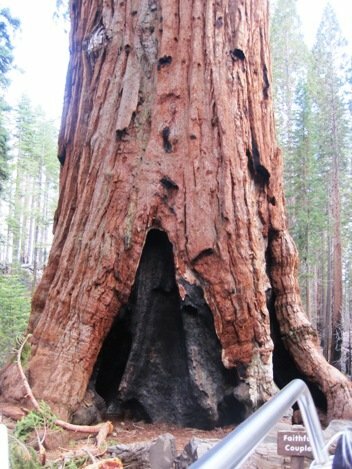 For complete information and assistance with planning your trip to the Grove, visit the official website Mariposa Grove of Giant Sequoias. 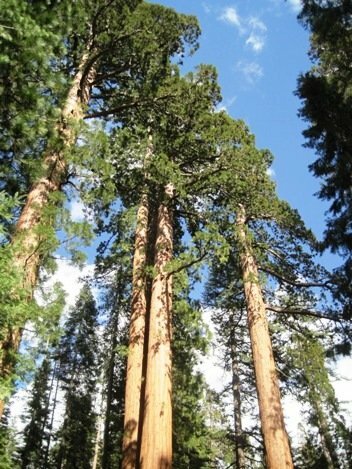 On June 30, 1864, President Abraham Lincoln signed an Act of Congress ceding the “Mariposa Big Tree Grove” (as well as Yosemite Valley) to the state of California. 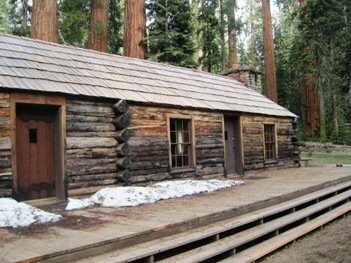 With the establishment of Yosemite National Park, the state returned the grove to federal control after there was much criticism of stewardship over the land. 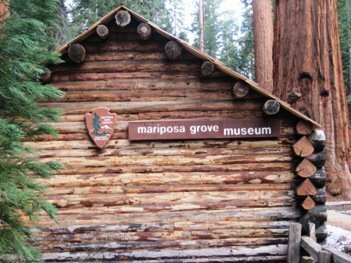 The Mariposa Grove Museum, which was once known as “Galen’s Hospice” after Galen Clark, the man credited with discovering the Giant Sequoias in the Mariposa Grove, is listed on the National Register of Historic Places. This entry was posted on Tuesday, June 7th, 2011 at 12:53 AM	and is filed under Nearby Attractions. Both comments and pings are currently closed.